We all get emails, some spark more of an interest than others, but a few, a rare few, make you sit up and grab your attention. Lt Hugo Mitchell-Heggs RN got in contact to let me know about a challenge that caught my imagination. I’ve been following long distance rowing challenges on an ad hoc basis, after seeing Ben Fogle and James Cracknell famously row the Atlantic in my early teenage years. I even took up rowing, very briefly, but at 5ft 7″ tall, I’m not exactly designed to row, especially not in a team of giants. 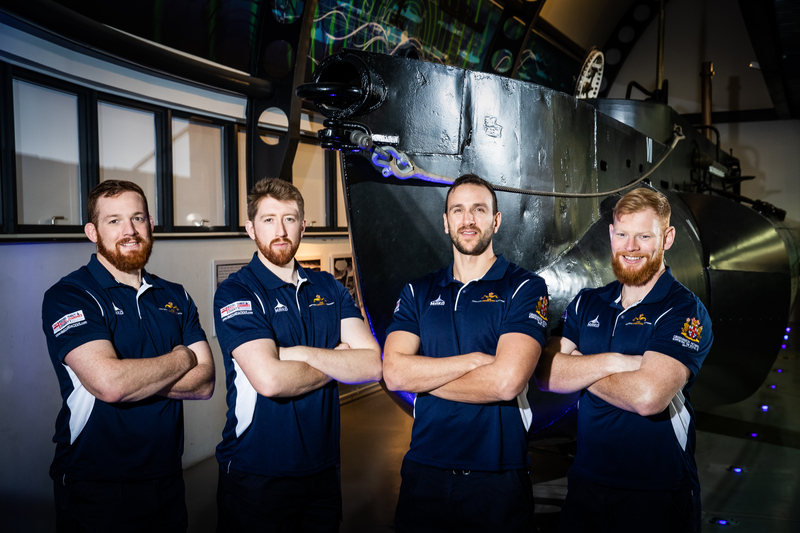 4 Royal Navy Submariners will row unsupported across the Atlantic Ocean in December 2019 racing in the Talisker Whisky Atlantic Challenge. A 3000 mile, unsupported race across the Atlantic Ocean, from La Gomera to Antigua, What sets this team apart from all their fellow boat crews is the nature of their job. Who else can say they spend their working days underwater, sleep underwater and above all spend weeks, if not months at sea, in a role that world few of us can understand or relate to. Of course, the first question this conjures up is the bleeding obvious….. how do you train? The Talker Whisky Atlantic Challenge, though an organised race, is anything but predictable. With the team set to row over 1.5 million oar strokes, waves up to and in excess of 20ft high standing in their way, 12kg of weight lost on average per team member and the psychological isolation of the 3000 miles of open ocean, it is a immense strain on body, and more importantly mind. The team’s goal is to reach Antigua in first place and in doing so, raise over £100,000 for the Royal Navy & Royal Marines Charity. Next year will mark 50 years of unbroken service in maintaining Continuous At Sea Deterrence (CASD) and this will be one of many events to recognise the human endeavour and commitment necessary to sustain this vital operation. To provide some perspective, given many would feel those working in the secret world of submarine warfare, their regular “home” is pure luxury when compared to their ocean going rowing boat. Below has a taster of the sheer difference in size, luxuries and power. Now, if you are as intrigued as I was when I first learned of their expedition, they will be attending shows and other events this year, to raise awareness and importantly money for the Royal Navy and Royal Marines Charity. 31 July – 6 Aug 2019: Expedition row from HMNB Clyde – We will be taking the boat for its first training expedition for 5 days around various Scottish lochs to get used to the boat, being on the water. So a huge feat of endurance, a great cause and as we are from a country with one of the longest maritime traditions in the world, due in part to being on an island, one that I hope many will find of interest. I’m hoping to meet up with Hugo and the team and follow their training before they set off on an epic adventure. If you want to find out more about the team and HMD Oardacious – Click HERE. For more information on the Royal Navy & Royal Marines Charity – Click HERE. For more information on the Talisker Whisky Atlantic Challenge – Click HERE.